The Taravo and Rizzanese flow out of the lower granite ridges to the south east of Corsica. Consequently the effect of snowmelt is lessened (if not entirely absent) and the rivers will depend mainly on rainfall to determine the levels. When deciding on a canoeing programme the two rivers are best thought about as one unit because of their geographical proximity. 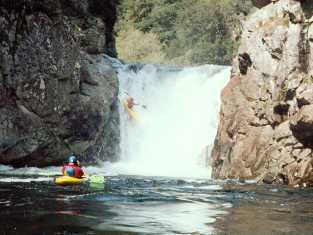 In that way good paddling can easily be found in the area whatever the water level. Low water will bring the Rizzanese and upper Taravo into play, whilst high levels will cause you to move further down the Taravo, or enjoy the scenic but easy waters of the lower Rizzanese. TARAVO Upper | Middle Section (1) | Middle Section (2) | Lower. The Taravo is much longer than the Rizzanese. It starts as a small mountain stream at the Col de Verde, less than a kilometre from the start of the Fium Orbo. The highest practical start point is at the village of Palneca. 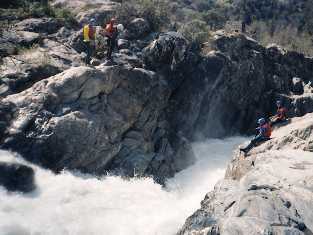 The river is initially quite small, needing a reasonable amount of water in the valley to make it canoeable. The first obstacle to cross is the town dump, which impinges onto the river. Although the dump is soon passed it's effect can sadly be seen for the entire length of the river. Plastic bags, car tyres and bottles are trapped in the undergrowth on the bank for miles downstream. The river soon grows in size as streams join from both sides. Initially it runs at grade 3-4 with the occasional flatter bit, but beware of fallen trees. It will have become a good grade 5 as it flows past the village of Ciammanace, and continue at that grade until shortly above the bridge at the D757 north east of Olivese. The short gorge section above this bridge is tricky, much harder than the rest of the river. It is best to inspect on foot before getting on the river. Often the whole of this short section from near the level gauge down to the bridge is portaged. A level gauge is situated upstream of the D575 bridge, on the right bank, about two minutes walk up the gorge. A water level of 130-160 centimetres would be ideal for the entire length of river down to the D26 bridge. It could be run about 20 centimetres higher or lower, but that would be hard work. Below the D757 bridge the river begins to ease off, with fairly long continuous stretches of grade 3 to 4 water enlivened by the occasional more tricky fall. In particular the final two kilometres are continuous 4 to 5. The river remains fairly wide and open, so inspections and portages are easy, making the Taravo a good river for a warm up before committing yourself to the harder gorges of the high mountain rivers. A second level gauge is situated by an old Genoese bridge about one kilometre's walk downstream of the N196. This gives a good indication for paddling anything below the D757. At a level of 100 centimetres the river is just paddleable, with 160 being an optimum level for a good fast bouncy run and 190 being very hard work. By now the river is much less steep, and appreciably higher volume. In parts it has a character much more like an Alpine river than a typical Corsican stream. It runs in a thick wooded valley, and the pleasure is derived from the speed and power of the water, rather than the typical drops and falls of the higher mountain rivers further north. The hardest bit of this section is a stretch either side of the bridge on the N196. This is an easy grade 5 at optimum level, grade 4 when low. The remainder is grade 3-4 and well worth a paddle, especially if the river is high. Access/egress is possible at any of the bridges. Once below the Punta de Calzola the difficulties are almost over. A few more rapids close to the bridge run at about grade 3, then the river eases off to give about 9 kilometres of grade 2 down to the sea. Egress can be obtained at the D157 road bridge, or on the beach itself. A justly famous (or infamous) classic, known throughout the canoeing world for the 10 metre waterfall in the gorge section. 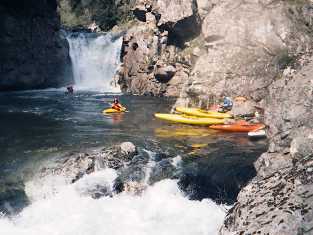 Less well known is that the gorge also contains other falls of 6, 4 and 3 metres, and 4-5 kilometres of good grade 5 paddling. Not to be missed. The standard start point for the Rizzanese is the bridge on the D120 near Zoza. A gauge here should ideally read between 60 and 90 centimetres. Alternatively the 1 kilometre section above the bridge can be paddled at grade 5 if a warm up is required. Start by a right hand bend just below a not very obvious grade 6 fall. Below the bridge the river opens out, and becomes more pleasant and scenic. The river runs initially at grade 4, soon increasing to grade 5. There are probable portages at two 6 metre drops about one kilometre apart. In both case the river has cut back into the rock to produce very enclosed drop pools with big tow backs. Upper Rizzanese - a sloping 6 metre fall which shows you are getting close to the big drop. Shoot the 2 metre fall on the right at speed. The stopper is powerful. The route over the lip of the 10 metre fall is normally over the shallow patch on the extreme right, close to the rock wall. The aim is to to avoid the bottom stopper, and a suspected rock to the left in the plunge pool. 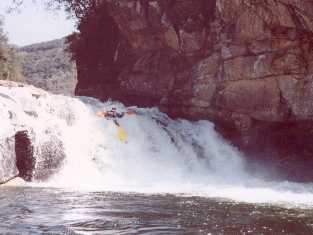 The drop pool is exitedby a further 2 metre drop, normally taken on the extreme left. Below this the river begins to ease off, but there are still two falls to note. Firstly a simple looking 2 metre drop which washes onto a deeply undercut rock below and to the right. Secondly a 6 metre drop into a very boily pool which is very reluctant to give up swimmers. In the last three years it has released one dead body and one swimmer alive but unconcious. There is a sloping chicken chute to the right which is much more fun and less nerve wracking. It is possible to get to the road from near the 6 metre drop, point by carrying up a footpath on the right bank to the N194. But it is often best to paddle the 8km of grade 3 river to the bridge on the D69 below Arbellara. This provides a much less strenuous carry and a shorter drive. This stretch of river is especially pleasant, and is worth paddling in it's own right if the rigours of the upper Rizzanese are not wanted. 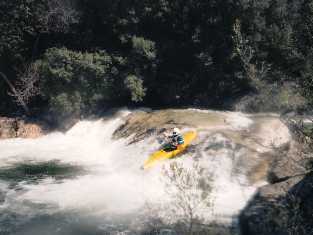 Simple rapids and a few broken weirs enliven a pleasant run through a scenic wooded valley. There is a campsite close to the exit bridge. 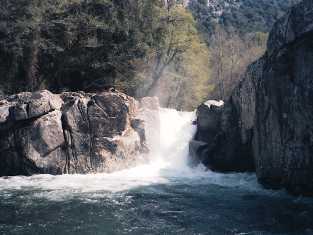 On the East coast of Corsica, many of the grade 2 touring rivers run through flat sedimentary landscapes, and are not especially attractive when compared to the scenery of the mountainous areas further upstream.. On the West coast however, the lower stretches of most of the rivers are much more attractive, although these easier stretches are often quite short. The Rizzanese does provide one of the longer and more attractive of the grade 2 stretches on the island. A total length of 14 kilometres of river can be paddled, starting at the D69 road bridge. If a longer journey is wanted then a continuation round the coast into Propriano harbour is easily planned. For some reason completing a river trip at it's meeting with the sea always adds an indefineable sense of satisfaction to the day.